Oops…almost forgot about one of my past burgers. 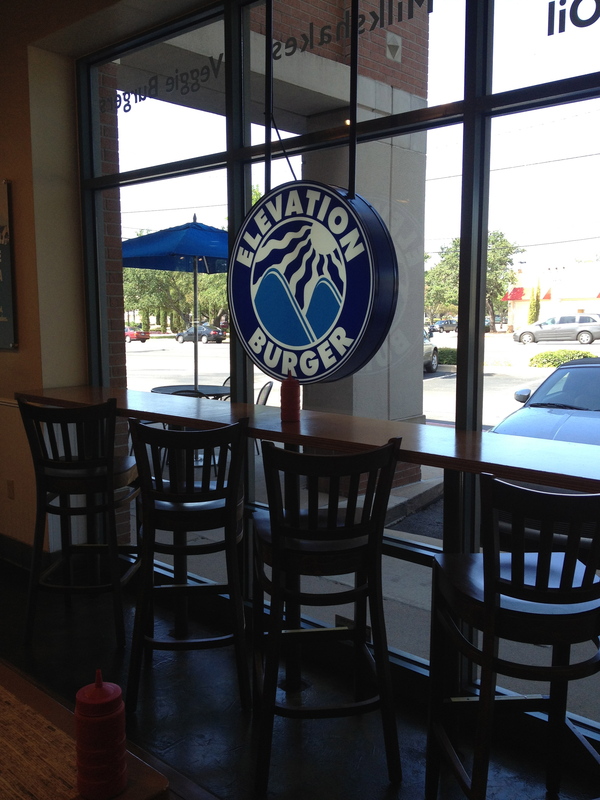 Although the first Elevation Burger opened in 2005, we didn’t get one here in Austin til a few years back. Seemed to fit right in with the Austin vibe – environmentally friendly; organic, grass-fed, free-range beef; fries cooked in olive oil. I’ve been there a few times now…each time hoping to fall in love with it. But yeah…that hasn’t happened yet. I mean, I appreciate what they’re trying to do in terms of using better ingredients and their concern for the environment, but evaluating them solely on taste…they didn’t knock my socks off. The location I go to, on the north side of town, has clean, simple decor and is well-kempt. The staff has been friendly on each of my visits, which is always a plus. The burgers are on the small side, and they only make one size patty. So if you’re hungry, you can’t really order a bigger burger, but you can make it taller…the Vertigo Burger. On this particular menu item, you can have anywhere from 3-10 patties. 10 patties?!?! That just sounds crazy to me, but to each his own. 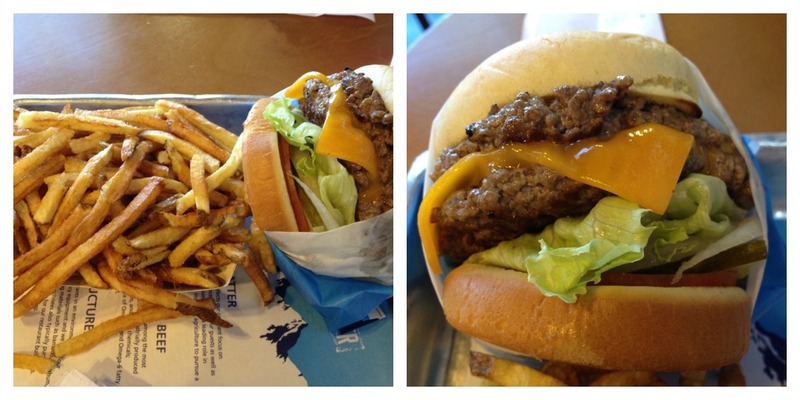 I go with the standard Elevation Burger – two all beef patties, two slices of cheddar, and your choice of toppings. I have to give it to Elevation Burger for giving you the option to choose from a list of toppings without charging you extra like some places will. My toppings of choice (usually on any cheeseburger) are lettuce, tomatoes, pickles, raw onions, ketchup and mayo. EB also offers some more unique options like caramelized onions, balsamic mustard, hot pepper relish, and Elevation sauce (reminds me of the In-N-Out spread just to give you a point of reference). Oddly, though, the “top”pings are placed between the bottom patty and the bottom bun……bottomings?? Visually, it’s a gorgeous burger and well constructed. The meat is juicy, but lacking in flavor. Let me try to explain… The patties have a clean meat flavor, but I prefer it when you can actually taste that the meat has been seasoned or when the meat has a nice char flavor like you get when you grill ’em at home. Obviously being able to taste the meat is what’s important, but I feel that the experience can be enhanced with just the right amount of seasoning or by the method of cooking. I have a coworker that thinks the EB fries are the best he’s ever had. For me, they’re just ok. I don’t know if it’s because olive oil has a low smoke point, but the fries end up more brown than golden and have a nutty fruity distinctly olive oil flavor that I’m not such a big fan of. 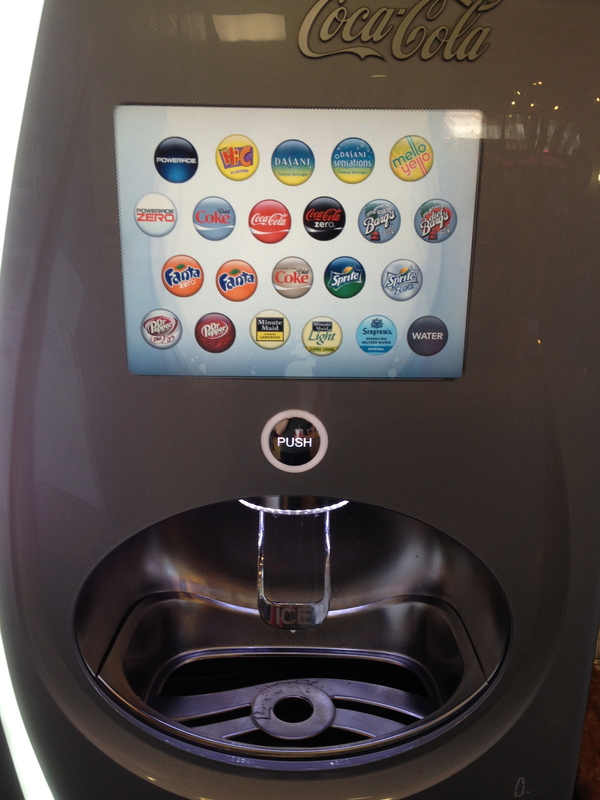 However…I’m in LOVE with their soda machine! !